Marine Engine Mounts have come a long way from the days when an engine was welded or bolted directly to the engine bed or stringer. When this was a common practice, the engines were huge, heavy, low rpm engines. These engines were so heavy and slow turning they absorbed whatever vibration that might have been generated. Today’s modern gasoline and diesel engines are much lighter in weight and operate at considerably higher rpm’s than older generation engines. This change is largely due to the never-ending race for more horsepower. In order to develop more horsepower and efficiency, and also meet the new, more stringent EPA requirements, lighter weight, high rpm engines are becoming the industry standard. The lighter mass of these engines does not allow them to absorb the harmonic vibrations that are found in all engines at various operating speeds, so vibration isolating engine mounts are needed. Also, as the engine weights decrease and power (thrust) increases, the functions an engine mount must perform become much more complex. An engine vibrates in three different fields of motion; fore and aft (longitudinal), side to side (lateral) and up and down (vertical). All of these motions are controlled by the engine mount but not always to the same degree for each motion. Most engine mounts are designed to severely restrict longitudinal, fore and aft thrust and vibration yet allow some lateral and vertical motion to dissipate vibrations. A plain rubber doughnut mount will absorb vibration but in a marine engine, you also have the forward and reverse thrust (shear) generated by the propeller that must be controlled by the engine mount. There are a wide variety of mount styles to choose from. Smaller diesels with one, two and three cylinders are more apt to use rubber doughnut style compression mounts which allow the engine to move the same in all directions. These mounts are built fairly stiff to control engine vibration and absorb propeller thrust. 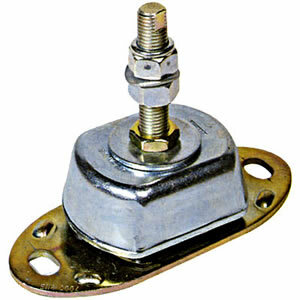 Generally, compression mounts are shorter and can fit in many applications. Find the correct engine mount with the engine mount cross-reference guide. On larger, more powerful engines, propeller thrust is much greater so a shear type mount is used to control the thrust but it allows for greater lateral and vertical movement to isolate engine vibrations. This means the mount can be softer for better vibration isolation but is preloaded for superior control of longitudinal motion which also helps maintain better shaft and engine alignment. If too stiff a mount is selected, the vibration control is minimized which means that engine vibration will be transmitted directly into the boat hull which will act much like a big loudspeaker with unpleasant results for the boat’s occupants. Proper sizing is very important to prevent this from happening. One of the most common installation errors occurs when the engine mounts are installed on the engine bed improperly. It is imperative that the mounts are perpendicular to the engine’s crankshaft; so that when the mount stud goes through the engine bracket it is not pulled to the side, or fore and aft, preloading the mount. Also, the bottom adjusting nut on any mount should not be more than 3/8 of an inch off the base of the stud. Raising the engine too high greatly increases the engine mounts dynamic load and the mount will not function as designed. It is best to put a shim under the mount rather than raise the nut too high. Mounts do age, fatigue and even fail, so periodic replacement is a good preventative maintenance measure. Some engine manufacturers recommend mount replacement every five to seven years. If you are replacing a broken mount, it is best to replace all the mounts due to fatigue caused when the intact mounts take on the additional load from the broken mount. If you choose not to do this be sure to replace the mount with the exact same mount. Using a different style or weight mount could induce failure of the old mounts. Too stiff a mount will break when used with softer mounts because it will not move as much as the softer and older mounts. Mounts with cast aluminum bases are preferable because they offer better corrosion resistance. Steel components of the mount are usually zinc plated and passivated to resist corrosion. Some mounts offer a metal shield over the rubber damper to protect it from petroleum contaminants. Also, some mounts are mechanically captive which means the stud will not pull out of the mount in roll over or severe impact situations. If your vessel strikes a submerged object that damages the propeller or shaft, be sure to closely inspect your mounts for damage or breakage. This is sometimes difficult to determine so use a bright light and a mirror to check all the way around the mount for cracks, broken studs or a displaced rubber damper in the mount. It is not uncommon to find broken mounts on recently surveyed vessels so it pays to periodically check your mounts and replace them if they are fatigued or damaged. You can enhance the life of your mounts by keeping them clean and free of corrosion and oil coatings. To ensure that you get the marine engine mounts best suited to your application, always follow the engine mount manufacturer’s guidelines.